Ronny Deila thinks the challenge from Aberdeen will only increase the determination of his Celtic players to stay at the top of the Premiership. 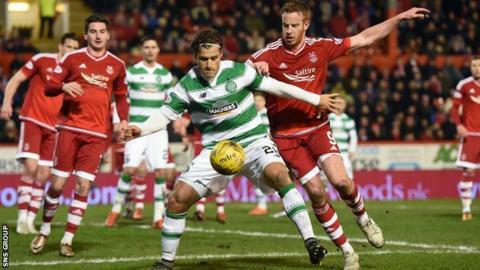 Celtic lead the Dons on goal difference with a game in hand after losing at Pittodrie on their last league outing. "They're going to be more hungry," manager Deila said of his team. "They know that it is very important to keep momentum and winning games and getting performances. So, it [Aberdeen drawing level] is doing us better." Aberdeen beat Celtic 2-1 three days after Deila's side lost their League Cup semi-final to Ross County, who visit the champions on Saturday. "I am very impressed with what Aberdeen have done," he added. "We have won many games in the league, we have lost three games in one year and they have done very well. "Up in Aberdeen is always a tough game. We should have doe more there but now we need to just get back on track again. "You need to react even better if you are pushed from behind." Deila rejected the notion that Saturday is an opportunity for revenge but added that his team has a point to prove against County. Celtic took an early lead at Hampden but were soon reduced to 10 men following a red card for Efe Ambrose and lost out 3-1 to the Dingwall outfit. "We really want to bounce back after the semi-final," said Deila. "We have to take with us the first 12-15 minutes when we created a lot of chances and do that for 90 minutes. "It's about getting momentum now, getting on the right track, winning football games. If we do that, everything will be good, we'll get confidence in the team and play well." Deila also said that it was "normal" that other clubs would be interested in signing Charlie Mulgrew, who is out of contract at the end of the season. He insisted that the focus for the player and the club just now is to "get him back up to his highest level" following a prolonged spell out with injury. There was no progress to report on midfielders James Forrest and Stefan Johansen, who have 11 and 17 months to run on their respective deals. "It's never [straightforward] in football," said Deila. "They have to really want to play for Celtic as well. We will see in the end who is with us for the future and who is not." Deila added that he has not spoken to Leigh Griffiths following threatening remarks aimed at the striker's family on social media but is confident that the player's form will not suffer. "He's quite strong mentally and he knows what's right or wrong," he said of Celtic's top scorer. "He's performed very well this season and he just needs to keep his focus on the same things as he did earlier."